Sharon Wells Wagner, author of Red Wells, collaborated with her son, Stephen Wagner, on this extraordinary ­account of one of history’s greatest conflicts: World War II. 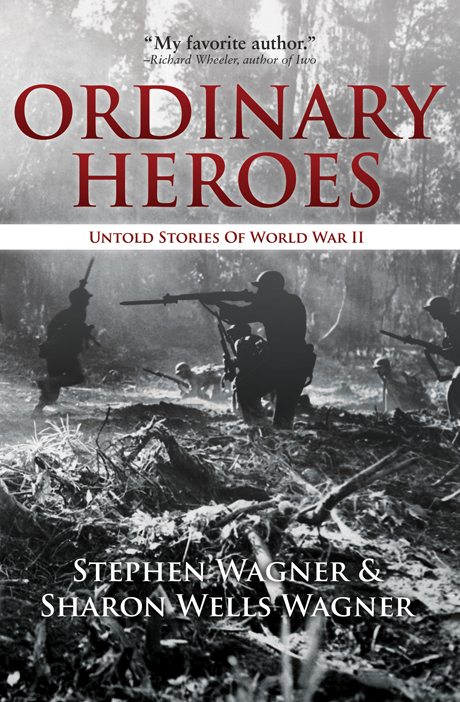 Told through the eyes of its participants, Ordinary Heroes is a compelling collection of true stories woven into a single narrative spanning the entire war â€” from the waters of Pearl Harbor to the sands of Normandy to the mountains of Okinawa. The result of more than sixty interviews, this is a story about enlisted men â€” ordinary men whose families struggled to survive the Great Depression, who grew up on farms and in the small towns of rural America. When called upon to serve they rose to the challenge, casting their old lives aside to become soldiers. In war they saw the best and the worst of humanity. They ­experienced beauty and terror, joy and heartbreak. Those who ­survived returned home profoundly changed. War leaves its mark on the best of men, and the ­extraordinary individuals within these pages are no exception. They did not turn their backs when history needed them most, but met the challenge head on. In doing so they brought peace to a world at war. Stephen Wagner was born in Reading, Pennsylvania. Following his early interests, he studied history and filmmaking in school. As an entrepreneur, he has worked as a graphic designer, ­photographer, author, and publisher. His first book, Ordinary Heroes, was ­co-authored with Sharon Wells Wagner and features war ­stories from over sixty veterans near his home town. His second, Forgotten Widow, has gathered attention from aviation enthusiasts ­worldwide for its portrayal of the historic recovery of the world’s only soon-to-be-flying P-61 Black Widow night fighter. Sharon Wells Wagner is the author of three books about World War II: Red Wells, Ordinary Heroes, and Forgotten Widow. She is an author, publisher, and artist who enjoys playing guitar, fishing, and playing Scrabble in her spare time. Her father’s participation in World War II instilled in her the importance of documenting history so that it is not forgotten. Thus, she spends many hours working with veterans and participating in historical events. She produces and co-hosts a television show called Tales of World War II in her home town. Her future plans include releasing a new book on World War II and writing and illustrating children’s books. She lives in Berks County, Pennsylvania.